BLawgDog : Would Google.CN be a “Non-Search Engine” Site? Just another Weblog on Cyber Law, IP Law and Social Development, about China. Would Google.CN be a “Non-Search Engine” Site? Google’s SVP David Drummond announced the official reason of such change (underlines added). Regardless the political concern of Chinese authority, the current web page at GOOGLE.CN and the above announcement can be described as a smart lawyering thing. By this change, Google may claim that GOOGLE.CN is not using the prohibited URL forwarding technology. And because the linked page google.com.hk) has nothing but a blank search box and some links for the “Google.cn services like music and text translate”, Google is hardly to be condemned as an “illegal” or an “unmoral” one even in the tone of Chinese offical news agencies. I would not like to bet that Google could be blocked out of China entirely. But who knows what will happen? 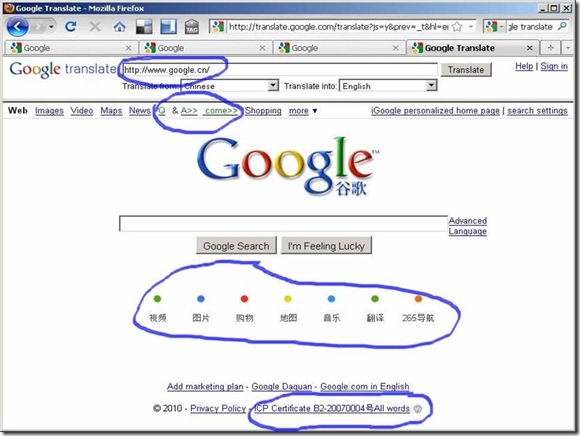 If Google is really blocked on mainland China, some clues might be found through what has happened. Firstly, Google wish to keep its “Google.cn services” at Chinese market. 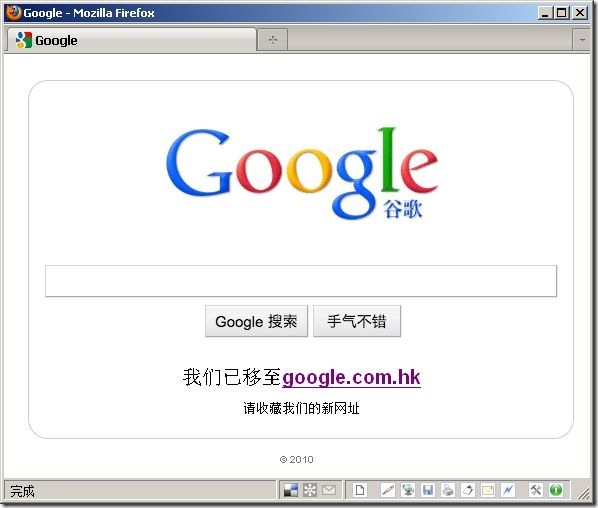 Since 2005, Google has launched some unique Chinese applications at Google.cn. These services are either not available (e.g. www.google.cn/music ) or unuseful (e.g. laiba, Google Book Chinese, Google Scholar Chinese etc.) for the users outside of China. Therefore, Google hope to leave them even when its search engine is blocked. The circled things are all Chinese applications. Second, Google wish to “offer unfiltered search in simplified Chinese”, but please be careful, Google does not say whether such unfiltered search will be available on mainland China, or at least available through Google.CN. Technically, language preference can be individually adjusted by any user in any Google account at any Google’s gTLD domain name. Therefore, Google will definitely continue to offer such service no matter China block Google.cn or not. Or, to some extrem, Google China (which is by law an independent Chinese company) may even continue to use Google.cn as an entrence of thlse Chinese Google services, while (if not too weird) such page may not include a search engine unless you log in with your Google.com account (which is a service provided by a foreign company). By the way, the similiar situation has actually been happening for a long time – Google.CN has never provided E-mail service. I will discuss this later on. Posted by Donnie on Saturday, July 3, 2010, at 6:35 am. Filed under censorship, CHINA, Chinese, google, search enginee. Follow any responses to this post with its comments RSS feed. Both comments and trackbacks are currently closed. « "My husband’s life is uncertain now. I will try to ship the garlic tomorrow, Okay?"